ISLAMABAD, Jul 3 (APP):Minister for Information, Broadcasting, National History and Literary Heritage Barrister Syed Ali Zafar Tuesday said education and book reading were powerful tools that could change the world and prepare a nation for future challenges. Speaking after inaugurating the Children Free Summer Book Club organized by National Book Foundation (NBF) here, he said children had qualities of heart and mind and they could become super heroes if they equipped themselves with education. He said the children were the future of Pakistan as they would take up important roles for nation building. Education prepared a nation for future challenges and time had come that it should be taken as a security issue, he added. The children would be joining important national institutions like the parliament when they would be adults, he said. The minister said the government fought the war against terrorism which was an issue of security. Similarly, lack of water and education were also posing security risks. Issues like controlling population and improving health facilities could be resolved through education, he added. He said education was ignored in the past but if the nation focused on it, nobody could stop Pakistan from making progress. He told the audience, including children, that he was an avid reader and used to read a book every week. He adopted the reading habit as his father encouraged him to buy and read books. Children should be motivated so they become habitual readers, he stressed. He said at the book fair to be organized from July 13 to 15 in Murree, children would get an opportunity to be among books and get familiar with the culture of book reading. He said people from all over the country visited Murree and the fair would help project a soft image of Pakistan. 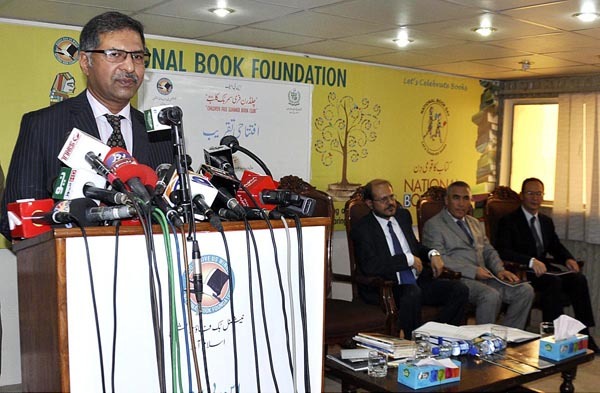 National Book Foundation Chairman Dr Inamul Haq briefed the audience about his organization, saying the NBF was selling books worth Rs 350 million every year through its outlets and it was taking steps to encourage the culture of book reading.